Want to rally friends, family and coworkers to support your passion to help young moms and their babies? We’ve made it super simple for you to host your own event to benefit Almost Home. 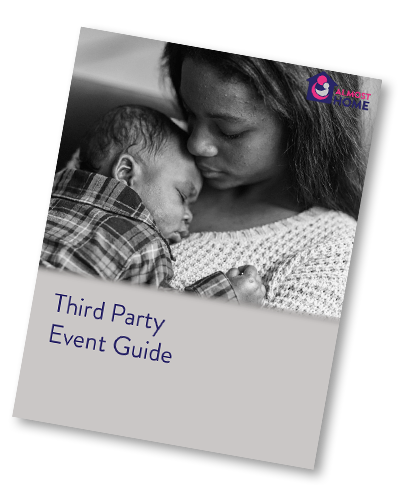 A Third Party event is a great way for ambassadors, advocates, and supporters of Almost Home to raise funds that allow us to continue helping low-income young moms get (and stay) out of poverty. If you are already having a baby shower, birthday party, or holiday event, in lieu of gifts why not ask guests to donate to Almost Home. Or, plan a team building activity with your co-workers with a focus on raising funds to change lives. The event possibilities are endless. Perhaps you have your own event ideas to raise funds and awareness about our work. Just let us know how we can help you support us! This Do-It-Yourself Fundraising Kit will help you make your event a success. Enter your email for a link to download it now! Ready to join our movement to end generational poverty? Complete the form below to share your fundraising idea with us, or contact us for an initial discussion.